Completed segment motives for exterior one cottager. Photo of the complete motif owe my friends with LJ. Soon following the finalization. Beautifully designed and executed! You have a real talent in marquetry. Your marquetry skills are astounding, beautiful job. They look right through the us. Your colours and grain choices are just so good. Nicely Done! You captured the eyes perfectly. Dusan you are so gifted, what a beautiful piece. My wife will love this as much as I do. 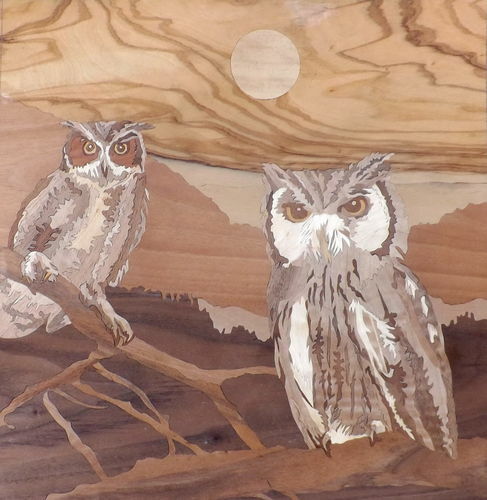 She is nuts about owls and she has asked me to do one for her in marquetry. 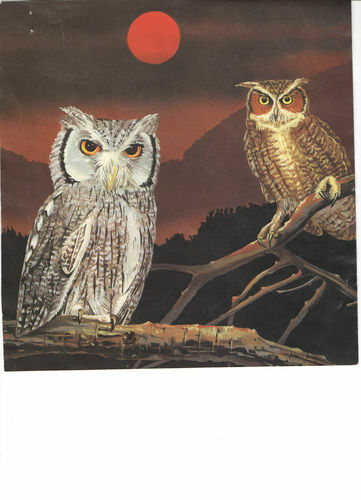 I especially like the night scene and the wonderful things you did with the colors and the branches. First rate work on both. Very inspiring. Always a Pleasure to see your Work Dusan, thanks for taking the time to share it! Amazing and the time you labored sure shows. I thank our dear friends in the comments! Reviewing the vase profiles, ie, your projects, always re overjoyed discover how talented and imaginative people in medium wood reveal beauty! This is beautiful Dusan, You really have a keen eye in choosing your veneer. As always it is pure pleasure to see your work. Dusan, I so look forward to seeing your projects, they are always so well done and this one is masterfully executed. Great composition, superb veneer selection, and very well cut. I really like your choice for the night sky. Cant wait to see the final piece with some finish, I’m sure it will be awesome!